TESpro is the new weekly pull-out-and-keep magazine on teaching practice, designed to offer practical advice for teachers at every stage of their career. 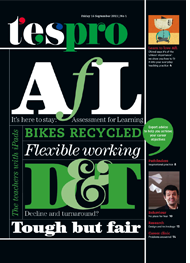 TESpro is the new weekly pull-out-and-keep magazine on teaching practice, designed to offer practical advice for teachers at every stage of their career. This invaluable supplement is only available when you buy the print edition of TES. Pedagogy advice – an in-depth look at teaching practice that works, covering everything from ‘flipped learning’ to philosophy for children. 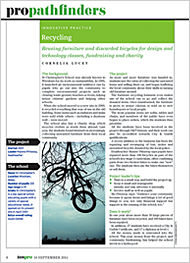 Pathfinders – find out how schools and individual teachers around the world have tried to solve problems from low take-up of meals to sectarianism. Research – the latest findings on education in the UK and across the globe and how they could impact on your teaching. Behaviour – an exploration of young people’s behaviour (in its broadest sense) and practical advice for teachers facing problems in the classroom. Career clinic – a chance for teachers to put their career questions to experienced practitioners. 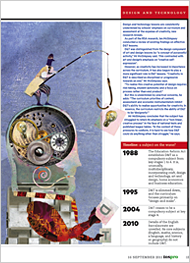 TESpro is available as a pull-out magazine inside the printed TES and in digital format to subscribers.